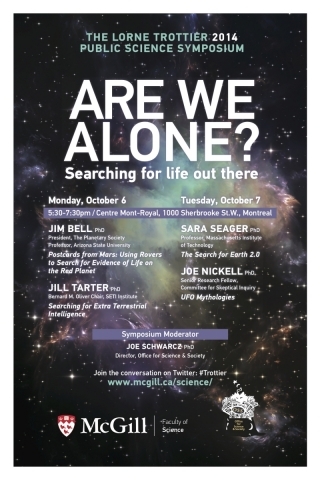 The question being asked may be “Are We Alone?”, but I don’t think I will be alone Monday and Tuesday night, attending an all-new edition of the Lorne Trottier Public Science Symposium. Dr. Joe Schwarcz hosts a two-night event on the subject of life in the universe, with four qualified speakers: Jim Bell, Jill Tarter, Sarah Seager, and Joe Nickell. For more information on the symposium, click here! Tags: Joe Schwarcz, Lorne Trottier Symposium. Bookmark the permalink.